Fremont, California – December 3, 2018 /Prexly/ – Biolytic Lab Performance Inc. is proud to announce their latest high throughput oligo synthesizer, the Dr. Oligo 192c, built on Biolytic's Molecule Synthesis Platform. Now restructured with all the same principles and key design aspects that have allowed them to become the world's fastest in oligonucleotide synthesis, the 192c incorporates a multitude of enhancements to new and existing Biolytic features. As the demand for highly parallel synthesis of standard and modified oligos has expanded – many labs needing 20 to 30 instruments just to keep up – Biolytic continuously designs instruments to accommodate the growing market. The 192c is no exception. It synthesizes up to 192 high quality oligos in one run, and is fast, secure and compact. This new instrument was built for operation in research and production facilities. After evaluating needs in the market, the company's Founder and President, Tom Demmitt, says there were two main objectives behind the creation of the Dr. Oligo 192c. First, "it was time to redesign our original instrument to incorporate all of the enhancements we added to the basic design over the years," and second, "cost reduction." The 192c is Biolytic's most affordable synthesizer. It came to life through innovative ideas of quality improvement and upgraded features, but most importantly, cost-efficiency. This has allowed them to provide all the key functions of their previous design – along with improved user experience, increased efficiency and outstanding reliability – all at a reduced price for their customers. "Reducing capital equipment costs cuts down expenses and allows labs to expand faster, which many of our customers are looking to do," says Demmitt. Another highlight of the 192c is a revamped reagent delivery system. It was designed with modern control boards and software, along with a more efficient layout and smaller valves to eliminate unnecessary waste. Demmitt shared, "these adjustments have allowed us to make accurate and consistent dispensing volumes down to 2ul." 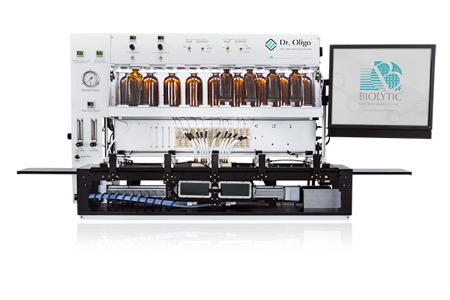 Biolytic® Lab Performance, Inc. designs, manufactures and sells the most advanced oligo synthesizers in the world. Founded in 1993 by four of the leading experts in the biotech instrument service industry, Biolytic continues to provide superior quality, innovative products and esteemed services that push the limits of research and technology. Customers all over the world use nucleic acids produced by our Dr. Oligo synthesizers for their own unique purposes. From applications like oligonucleotide and gene synthesis, genetic test kits, PCR/RT-PCR, siRNA/RNAi, miRNA, CRISPR Cas9, and DNA/RNA sequencing – to broader areas like evolutionary history, forensics, immunotherapy, diagnostic and therapeutic research – to high-throughput screening, natural product biosynthesis, reverse transcription PCP, hybridization, and SNPS – the variety is tremendous. Recently some have even endeavored into using nucleic acids as computer information storage devices, storing animated videos in DNA. The Dr. Oligo line has evolved alongside these cutting-edge discoveries, and it will continue to play a significant role in modern science with the Dr. Oligo 192c. Source The Dr. Oligo 192c by Biolytic Lab Performance, Inc.